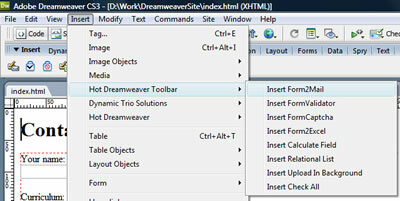 HotDreamweaver PHP Toolbar is a collection of HotDreamweaver's eight most popular extensions. This Toolbar is designed for work with forms on servers supporting PHP scripts. Purchasing the Toolbar allows you to save 37% compared to buying each extensions separately. Creates interrelated "select" lists: values entered in one list define the possible options in the other. The server where the site is hosted must support PHP scripts 4.0 or later. Writing permissions set in the folder "HDWForm2Excel/saved_forms". GD Library for PHP, version 2.0 or greater. The page that processes the form must have .PHP extension. You can find help, read FAQ, see video tutorials and details of each extension on the pages dedicated to each extension separately. To install the Toolbar in your Dreamweaver, doubleclick the .MXP file. This will install all the extensions automatically. 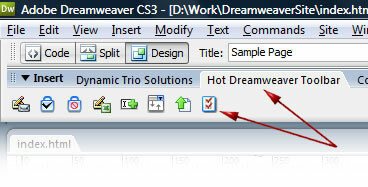 To apply the extensions to your webpages, access them via the Dreamweaver menu option Insert >> HotDreamweaver Toolbar or also from the Toolbar of the same name. Note that this menu location is different from that of the extensions purchased separately.